In 2012 I sat on my couch in Brisbane, Australia, and read about the must-see beauty of Montenegro in Lonely Planets’ Best in Travel 2013 Top Ten Countries list. I was immediately intrigued and knew that it was a region I would have to explore one day. Well, it took weeks of planning and mapping, but we just spent the last ten days travelling off the beaten track in the Balkans, with six of our good mates. We met up with friends who were travelling through Europe over the summer. With an aim to live the nomad lifestyle as long as possible, most of them are travelling on a strict budget and have camped, house sat and couch surfed their way through Spain, Italy, Austria, France and Germany. Because it sounded like a great idea at the time, and we are always keen to try something new, we decided to join them on their adventures and turn our own ten day holiday into an epic camping road trip. Did you glimpse part of our journey on facebook, or from seven of us using #nomadsinthebalkans on Instagram to upload a photo per day of our adventures (a competition in which I tied for the most likes). But how did we end up having lunch with a local Albanian family? And what about Kotor’s Old Town made it a highlight of our recent camping road trip in the Balkans? Read on to find out about our journey to four Balkan countries: Croatia, Bosnia and Herzegovina, Montenegro, and northeast Albania. Popularly referred to as the Balkans, the Balkan Peninsula in Southeast Europe covers an area of 666,700 square km (257,400 square miles) and is generally considered to include, in whole or in part, Albania, Bosnia and Hezegovina, Bulgaria, Croatia, Greece, Kosovo, the Republic of Macedonia, Montenegro, Serbia, Slovenia, and the European part of Turkey. They have been inhabited since the Paleolithic era, more than 12,000 years ago, and are also the location of the first advanced civilizations. The Ottoman Empire was the controlling force in the region at the end of the 16th-century until frequent wars broke out in the region. The First Balkan War was fought in 1912-1913, followed by the First World War and the Second World War. For several years after the Cold War, most counties in the Balkans were governed by communist governments. Their isolation from mainstream economic advancement, as well as hardship due to repression and starvation, left the region largely ruined and exploited. The landscape, borders and governments have changed significantly in the last 100 years, but tourism and the introduction of some countries into the European Union have helped improve conditions and economies. There is a mix of ancient ruins and perfectly preserved old towns and bridges scattered through the mountainous countryside, but evidence of bullet-ridden buildings is a reminder of the modern history of a war-torn region. In ten days we visited Croatia, Bosnia and Herzegovina, Montenegro, and northeast Albania. Being the end of the European summer, the region wasn’t heaving with tourists and the warm Mediterranean climate reached highs of 33 degrees Celsius, meaning it was warm enough to swim and not freeze in our tents at night. Dan, Simon and I flew from London to Zagreb on Friday night after work. It had been a hectic day and we had some dramas getting from our house to Heathrow Airport on the Underground before arriving at the airport to a delayed flight. I was grateful when the hostel owner generously collected us from Zagreb Airport and got us checked into the dorm room we were sharing with Alaryse, Luke, Steve and Tracey before 1am. Thankfully, it was clean, centrally located and great value for money. We were up early on our first morning and ready for our hired vehicle to be dropped off to us at 9am. Vehicle = the 9 seater, 2.9tonne, 4.7metre minibus that we rented from EasyRent. There was no reason to worry about fitting 8 people and all of our tents and luggage in the van, it was just what we needed! We drove via the airport to collect the eighth member of our troupe, Tina, and then headed south to our campground situated in the mountainous, rocky area of central Croatia, near the border of Bosnia and Herzegovina. We found the perfect spot in a clearing in the hilly grounds and set up our camp for the next couple of nights. After a relaxing evening together (and a few drinks), we flocked to Plitvička jezera (Plitvice Lakes National Park) and only got slightly lost on the way thanks to some confusing instructions from the GPS. Plitvice Lakes National Park spreads over 296.85 square km and has more than 1.1 million visitors each year. 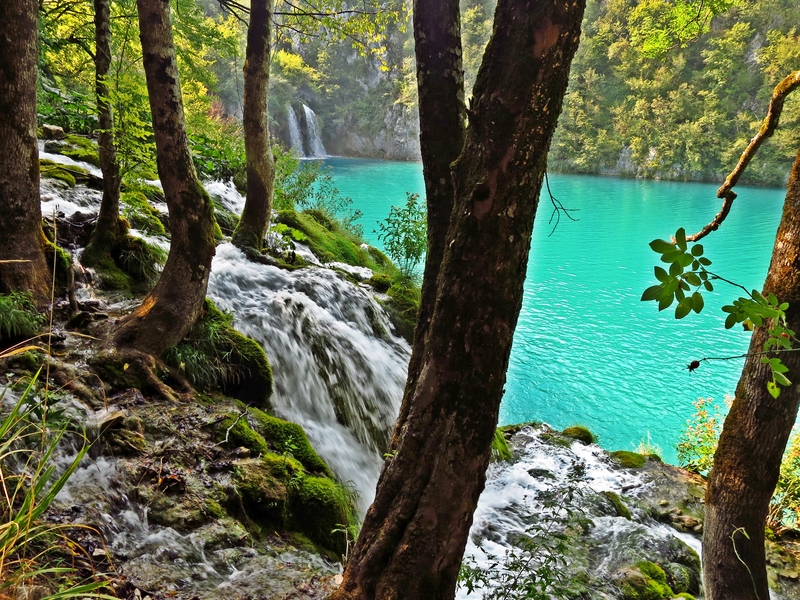 The largest national park in Croatia was founded in 1949 and is on UNESCO World Heritage register. It features beautiful blue lakes, a range of fauna and flora, and some stunning waterfalls. The entire walk, including a bus ride to the upper lakes and a ferry ride across to the lower lakes, can take about five hours. Border crossings: 5 – Croatia, Bosnia and Herzegovina, and Montenegro. On day three of our camping road trip through the Balkans, we drove from our camp in Croatia, through the Dinaric Alps in Bosnia and Herzegovina, along the Adriatic Highway on the Dalmatian coast and finished in Kotor, Montenegro. We stopped only for photo opportunities and for lunch overlooking the Stari Most (Old Bridge) in the city of Mostar in Bosnia and Herzegovina – and, in doing so, completed my “visit 30 countries by the age of 30” campaign. Mostar: The Stari Most is a reconstruction of a 16th-century Ottoman bridge in the city of Mostar in Bosnia and Herzegovina that crosses the river Neretva and connects two parts of the city. The Old Bridge stood for 427 years, until it was destroyed on 9 November 1993 by Croat forces during the Croat–Bosniak War. Subsequently, a project was set in motion to reconstruct it, and the beautiful rebuilt bridge opened on 23 July 2004. Mostar has a beautiful Old Town, several abandoned buildings in the centre and narrow streets that you can get lost in. Not ideal for an almost 5m long van trying to follow the instructions of the GPS. We had a slightly nerve-wracking situation when we were unable to reverse and had to continue down a very narrow two way street with traffic coming the other way. If I wasn’t already sweating from the 37 degree Celsius heat, I was certainly sweating after that! Despite what Google Maps told us, it took 14 hours to drive 626km and pass through five border crossings. We had been told to expect up to 2 hours delay at crossings, but it was relatively quick – our journey was made that much easier having the right car insurance and Green Card sorted. Side note: As a result of the Treaty of Karlowitz of 1699, the Neum region of Bosnia and Herzegovina cuts Croatia into two non-contiguous parts. We saw the last hour of daylight as we drove the winding cliff side roads from Croatia, to Bosnia and Herzegovina, back into Croatia and finally into Montenegro. Once in Montenegro, we wound our way around the Bay of Kotor until we saw the pretty lights of Kotor’s old fortress walls creeping up an enormous black mountain like a golden ribbon. This beautiful setting was our final destination for the day. After such a long day in the van (dubbed the Silver Bullet) we were happy to abandon our tents for the night and stay at the Old Town East Wing Hostel, right in the heart of Kotor’s unique old town. (Cue: Game of Thrones introduction music) Secluded on the picturesque Bay of Kotor (Boka Kotorska), the old Mediterranean port of Kotor is surrounded by fortifications built during the Venetian period and so beautiful and surreal that you wouldn’t be the only one to think you had just stepped in to a fairy tale or on to the set of Game of Thrones. After strolling through Kotor’s Stari Grad (Old Town), we paid €3 each to walk halfway up to the Castle of San Giovanni (Fortress of St John), also known to the locals as Tvrđave Kotora, for a breathtaking panorama of the fjord and a fabulous birds-eye-view of the Old Town. 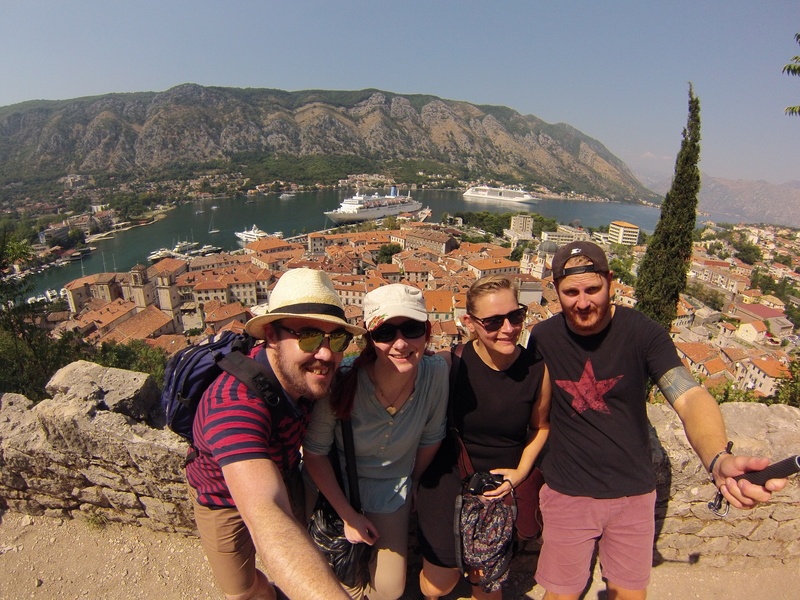 Find out more about Kotor’s Stari Grad and the Fortress. We grabbed a quick bite to eat before jumping in the car and continuing our journey south towards Albania. After the smooth roads and beautiful scenery in the north part of Montenegro, we were unsure about what to expect the further south we drove. Perhaps it was a good thing to have low expectations? The GPS guided us off the main highway and up the narrow streets heading to Bar’s Stari Grad. At first we were unsure about its directions and turned back to the safety of a petrol station where we could check Google Maps via their WiFi. We verified that the GPS did know what it was doing (for once) and we pressed on up the hill. Tracey battled the oncoming local traffic that included a two large busses, sheep, and cows, on the climbing, single lane road with a steep drop. 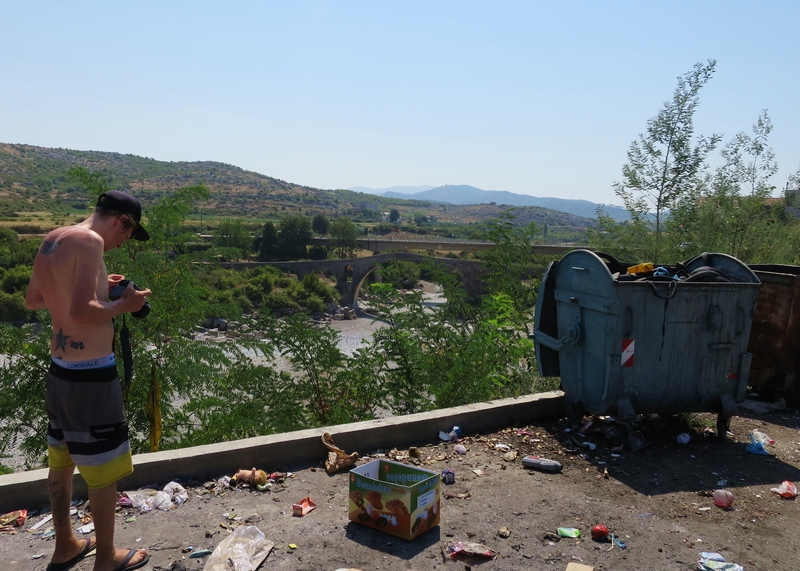 We had expected the roads to continue like this when we reached Albania, but (to our surprise) they improved greatly after the Montenegro – Albania border crossing. Until we reached the city of Shkodra (Shkodër), where the traffic didn’t seem to obey road rules and roundabouts were clearly just for decoration. Like we had seen in Turkey last year, the pathways were full of Albanian men loitering about cafes and shops, drinking Albanian coffee and simply enjoying life. Just beyond the city we were stopped by a police officer on the side of the road. Even though he spoke barely any English and we spoke no Albanian, we finally worked out that the “problem” was that we were driving without our headlights on – a “big problem” when driving in the Balkans! Perhaps it was the sheer terror on our faces, or the fact that we were clueless tourists, but we were luckily let go with a stern warning and allowed to drive the few metres away to our campsite. Arriving at Lake Shkodra Resort around 6pm, we set up camp in time to watch the sun setting over the lake and relax at the lakeside restaurant with a beer and some food. On day five, Tracey and I called a truce with the Silver Bullet and decided to have a rest day at the lake. It was the perfect excuse to catch up on some reading, swimming and relaxation – we were on holiday after all! We even tried paddle boarding! Side note: Albania is one of the least developed countries in Europe, meaning that outside of the cities many of the roads are in poor condition, public transport can be difficult to come by, and in the countryside there are near third world conditions (dirt roads, power cuts, no sanitation, no running water, limited medical care, and increased poverty). The average monthly wage is equivalent to £236 per month and several generations of one family will usually live in the same house they were born in for their entire life. Once we found the small village of Prekal (consisting of a church, a bar and a couple of farm houses), the single-lane two-way road turned into a winding dirt track and I was unwilling to drive the van any further. Instead, we walked a couple of kilometers and descended down the side of the mountain to a secluded and picturesque waterhole in the Kiri River. We were literally swimming in the front garden of a local farming family who used slippery stepping stones to cross the small river and reach the outside world. After our swim, the family generously invited the eight of us to join them for a lunch of homemade bread, goat cheese, meat (goat? lamb? ), the best tasting freshly picked figs and grapes, and raki, a fruit brandy popular in the Balkans. Everything we ate was produced by the three generations of family that lived on the small farm. Even though only one young girl could speak any English, we spent the afternoon chatting and laughing with Mama and Papa, five of their seven children, and Grandma. It was a truly amazing experience, even if too much homemade raki was consumed by some! Full disclosure: there was moment where I thought that they were louring us into a dangerous situation and no one else in the world knew where we were… but the thought was quickly squashed because “she’ll be right, mate!” and the Albanians we met on our journey are some of the nicest and most generous people I have ever met. We left the campsite early to fit in a brief lunch in Budva, Montenegro, and to get to our next campsite with time to swim in the afternoon. Despite a 30 minute wait at the Albania – Montenegro border and a ferry crossing across the beautiful Bay of Kotor, we made good time and were able to set up camp in the early afternoon. We sheltered under the shade of the 100 year old olive trees that filled Kamp Pod Maslinom in Orašac, just 11km north of Dubrovnik. A small pebble beach and restaurant sat at the bottom of the hill, just 250m from our campsite, and we spent the warm afternoon splashing about in the salty ‪‎Adriatic Sea. Thankfully, a surprise storm has cooled the air temperature to a reasonable 25 degrees Celsius and we all slept comfortably, listening to the rain against the soft walls of the tents. 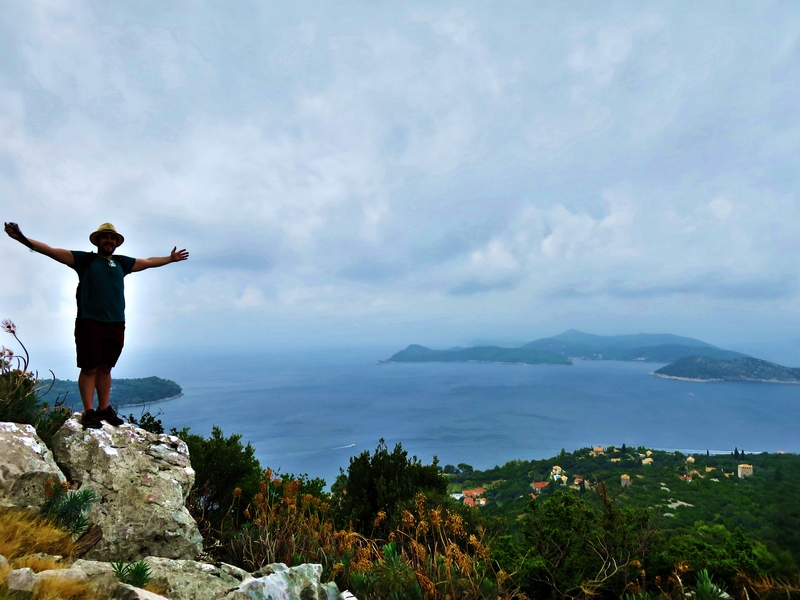 It rained on the 8th morning of our Balkan camping road trip but it didn’t stop us enjoying an easy boat ride out to the Elaphite Islands of Koločep, Lopud and Šipan. It was good to be out of the van and on the water, and we spent our time on the islands walking up hills, eating delicious BBQ fish cooked up by our Croatian skipper, and floating in the Adriatic Sea. It was on this day that our seemingly disaster-free road trip struck a road bump. After waking up with a suspicious hangover (3 vodkas? ), Simon joined us on the boat to the Elaphite Islands and then became violently ill. Being an IBS sufferer for the better part of the last two years, I had great sympathy for him and we all felt bad that he wasn’t able to enjoy the day as much as we did. We packed up our camp for the last time and drove into Dubrovnik to drop off the car. Thankfully, Simon had improved in health slightly and no one else seemed to have suffered the bout of gastro I suspected had infiltrated our camp. Looking back, I think that it is likely he contracted salmonella from the chickens he had played with at the Albania farm just a few days before… chickens! 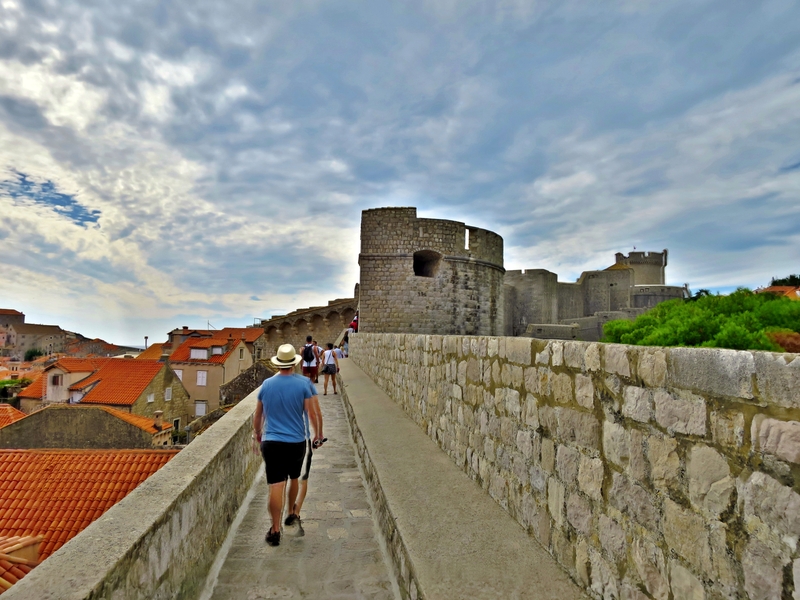 On foot, we explored the coastal Old Town Dubrovnik featuring old monasteries, beautiful palaces and the ancient City walls with an intricate and complex system of forts, bastions, casemates, towers and detached forts. The picturesque Croatian city is strangely familiar, probably because it was used for many scenes in the Game of Thrones TV series from Season Two onwards to represent King’s Landing’s exteriors. That afternoon, we walked the medieval City Walls, a 2km round trip with amazing vantage points overlooking the old town encased within and the beautiful blue sea beyond. During the evening we enjoyed a drink at sunset at a not-so-secret “hidden” bar in the rocks outside the city walls, ate delicious food at Gatsby’s (and paid London prices! ), and met up with our band of nomads for a final fling in the city at Buzz Bar. Dan decided that we needed to be a little bit spoilt on the last night of our epic holiday, so he booked a fancy studio apartment right in the centre of the old town. It was a beautiful and surprisingly large apartment, with a perfect mix of modern amenities and style in the ancient building. Could there be a more perfect ending to a wonderful trip with our great friends? Thanks to Alaryse, Luke, Simon, Steve, Tina, and Tracey for an amazing and epic camping road trip through the Balkans! Where are we going next? A holiday without drama or disaster? Obviously we are getting better at this travel thing in our “old age”! Relive my top five travel fails. Hi ! thanks for sharing your experience! it sounds a super good trip and I’d like to do it as well.. The rules and regulations will differ between the different countries. For example, some countries in the Balkans are in the Schengen Area and other counties have stricter border controls and travel agreements. And, you will need to carry specific travel documents, visas and car insurance for some countries in the Balkans. So, you are best to research the government websites of each of the different countries you visit to find out if free camping is allowed. I know that in Croatia it is strictly forbidden to camp in open areas outside registered campsites and illegal camping is punishable by law. You are only allowed to camp inside registered campsites or on parking lots expressly designated for campers and caravans. It is also recommended that you make an advanced booking, especially in summer or high season (usually June – September). We found that the campsites are relatively cheap across the Balkans and they are all very well equipped with modern amenities and sometimes kitchens or a restaurant. Let me know if you have any other questions. I hope you enjoy your trip!